I spent about 3-hours today at the DMV. I usually deal with the DMV online and have an account with the department just so that I don't have to go there. When I used that account several weeks ago for the purpose of changing my address, the system balked! It told me that my information was not correct. Also, that I would have to appear in person to update my address info. So, I made an appointment, and the system booked one for me. Only thing is, DMV is good a making an appointment. They are not good at keeping them. Anyway, after hours of waiting beyond my appointment time, a clerk handed me a form informing me, fill out this change form and I'll send it to Sacramento. Next time, just mail in this form when you have any changes. I am a very slow cabinetmaker. I've Blogged to you before about my becoming an apprentice cabinetmaker after retirement. Management told me that I had little talent with cabinets. And that's why they kept me on production work [5, 10 perhaps 50 cabinet orders]. I was good at production because after producing a few of these, my speed was acceptable. 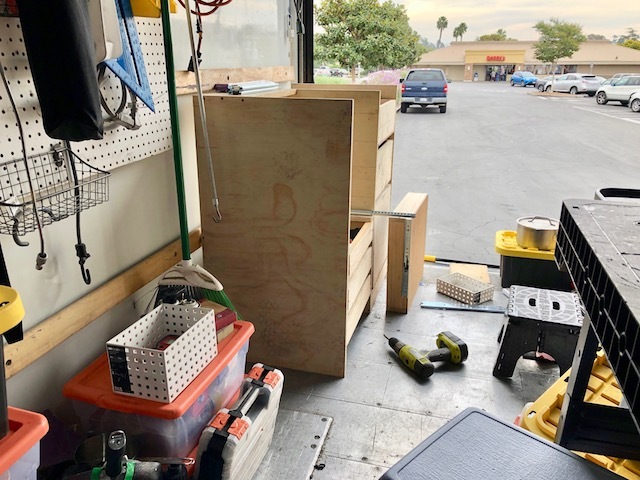 But here on my Box Van cabinet project, nobody is watching me. Or timing me. I get to produce cabinets for myself. And it is a joy for me! I love it sooooo much! The two cabinets in the pic below are going to be mounted right where they are now. Next to Box Van's big door. Directly across against the opposite wall, there will be a tall cabinet which will contain large items. My recently purchased DeWalt workbench will be stored there. Also, all manner of hanging things. My broom and long wood clamps, for example. Box Van is getting to be so squared away! The new drawer cabinets make the difference! With those drawers, there is a place for everything. And, there are still 2-drawers left to install in the cabinet! After every advance in the Box Van project, I square things away. This afternoon is the best its ever been! As a reward, I'm going to treat myself to a nice soak at the 24-Hour Fitness Navajo! It's the newest 24-Hour club around here. In this pic, we have a 120 volt AC lamp fixture helping with lighting. I have noticed that the Chrome browser handles images differently than the Safari or Firefox browsers. Clicking on one of my images using the Chrome browser produces an enlarged image that is much bigger than the other 2-browsers. 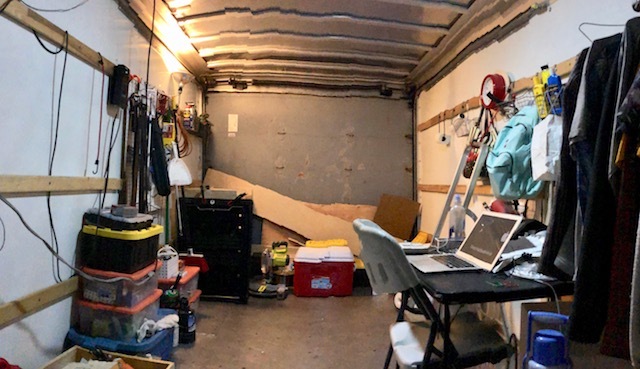 Tell us about the Insurance situation with an Cube Truck to RV. Are they hesitant and charge more? Do some carriers refuse etc.? That is a very good and interesting question. Box Van is a commercial vehicle and is registered commercial with the DMV. I am insured by Progressive Insurance as a commercial vehicle. However, I am well on my way to converting Box Van into a recreational vehicle. When Box Van is fully converted and is an RV, my insurance policy with Progressive will no longer be in effect. I will notify my insurance broker to secure me a policy with a company that will insure Box Van as a converted RV. The premiums for a commercial registered Box Van are much higher than for a converted into an RV registered Box Van. I will have to re-register Box Van into an RV with the DMV at that time. I really learned a good lesson when I retired from working. It was how valuable it is for me to keep being active! I shall not make that mistake again. Now, with my Box Van project, I am using some skills that I learned decades ago. As far back as the 1950s! Looking good George! I must admit I had doubts about this whole project, but you’ve erased all of them. Very happy for you and looking forward to following your future adventures! I have been thinking and praying for you! I bet other Readers are worried for you too! How are you doing in all that fire?! Thanks for your concern George! We were 2 houses away from evacuation and ready to go! Fortunately for us we’re OK, but as you know, many are not. Thought for a moment I should never have sold the Winnie! Terrible smoke and air quality. Thanks again. Your experience may be a lesson for RVers to keep their RV as a place of refuge when disaster strikes.